The true significance of the number 42 has nothing to do with The Shining or The Hitchhiker’s Guide to the Galaxy. Everyone knows the story of Jackie Robinson, right? Well, maybe not. And maybe as a long-time baseball fan (not just of the game, but of the history and of its impact on American society) I took that for granted. 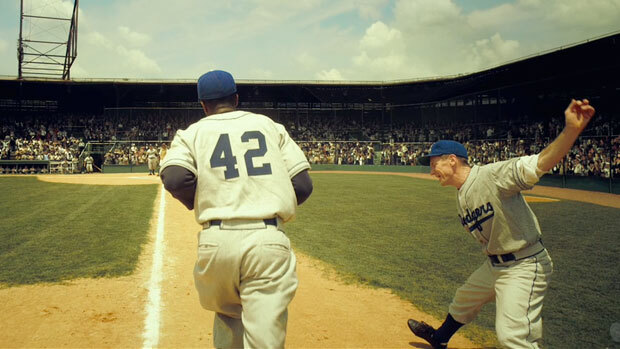 As the first African-American to play in the major leagues, Jackie Robinson put a dent in segregation in 1947 (and wore the number 42) long before Jim Crow laws were dismantled and the Civil Rights movement caught on years later. Thanks to Brian Helgeland’s handsomely mounted and wholesome-as-Ma’s-meatloaf biopic, 42, younger generations will now have an entertaining and educational film to watch in history classes for decades to come.